Emmy, you continue to amaze me each and every day. It amazes me at how far you have come in 14 months. You are full of words and love to babble all day long. Some of the words you can say are: ball, bye, hi, mommy, daddy, nanny, popah, sissy, kitty(didee), puppy, pony(bobby), no, yes, sit down, up please, what's that, uh oh, noodles(noonles), outside, cup, hot, baba, tv, sun, baby, all done, more, pee, potty and a few others that have escaped me. You also sign very well and continue to use them as often as you can. You sleep like a champ, but you started out well too. Your bedtime is eight o'clock on the dot and all I have to do is lay you in your bed and you are out. You sleep a solid 12 hours or so and then you wake up happy as can be, ready for the day. Your nap is about 11am and lately you have been sleeping for about 3 hours. You only nap once a day, but I am okay with that. Your eating habits are marvelous too! You do pick and choose once in awhile, but for the most part you will eat 5 times a day and everything on your plate. I am so proud of you but wish you would eat a few more veggies. You just started drinking whole milk full time a couple of weeks ago. You appear to have adjusted well, which is awesome! Princess Emily, you now have 9 teeth, with a molar just arriving while we were in Florida. The only one that has seemed to bother you is that molar, but Tylenol seems to ease the pain a little. Your temperament is something that varies depending on the surrounding people. Usually you are glued to me; your mommy. You burst into tears the moment I leave the room or out of your sight. Thus, we have become potty partners. LOL! Even when you are happy with the world, mommy is the one thing that makes your world even better. I hope this is just a phase though. As much as I love your attention and your snuggles, peeing without being watched is on my list. You and Izzy play well together most of the time. Thankfully there has never been hostility from either of you. No hitting or anything like that. Sometimes you take Izzy's toys and that upsets her, but she is still learning to share as well. You love to bounce on the bed with her and chase each other throughout the house. And, you are very good at picking up things from her. Almost too good...in fact, there are some habits I must insist that you do not follow. LOL! So my dearest sweet pea, congrats on your first 14 months. You are such a smart little girl and I love you to pieces. Remember that always...just in case mommy doesn't have photo proof. LOL! Wow! I am very impressed with that vocabulary at 14 months. You should be a proud mama! Love the outfit on that little girl! 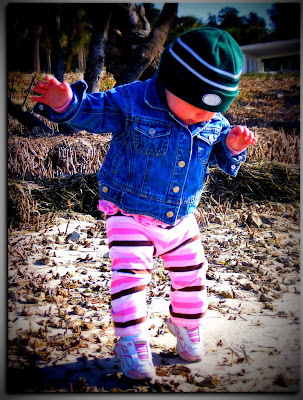 That is the cutest picture...almost like she is trying to do some type of Michael Jackson move. Wow! She is doing great for 14 months! 9 teeth too! LM has two, TWO. And last week the doctor said she doesn't see anymore even trying to get through, lol! She's a prodigy! And you already know I think she's gorgeous. oh she sounds delicious!! - and gets used to the bathroom buddy! hee hee - I have three of those - and the dog! Love that action shot of her-- too cute! Oh yes the bathroom buddy! Until you can safely lock her out she will remain your bb! Aww! She's precious :) Wonderful post!! She is just adorable and sounds like the sweetest, easiest baby!!!! What a sweet post for a sweet girl. Happy 14 months. Holy canoli! My son can't say some of those words and he's 2! I'm jealous. Love the list of milestones! Oh, what a cutie! very sweet tribute to an adorable little girl. Wow, what a sleeper! I'm so jealous. I love how she is standing on her tiptoes, and I love the border around the photo. I love love love that age she's age. What a little cutie pie taking those sweet baby steps. My Melody is a great sleeper too...I love it! This is a really nice post about your little one! She is a cutie pie! what a great photo and a great little girl to match. she sure does have a great vocabulary! What a sweet letter to remember her as she was at this time in her life!